Wade Hampton (1818-1902), Lt. General, CSA (SC). Famed ANV Cavalry Commander. WIA-Gettysburg. 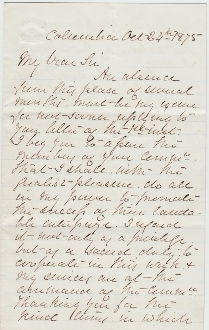 Autograph Letter Signed (ALS), 1 1/2 pages, 8vo., Columbia (SC), Oct. 24th, 1875 to Col. J. Bassett French pertaining to helping to promote an enterprise.